Google and Facebook will receive a staggering 84 percent of all digital ad dollars in 2017 and will account for all Internet advertising growth for the year. That dominance “is exceedingly bad news for the balance of the digital publisher ecosystem,” the investment management firm GroupM said. The two Internet giants are not only raking in all the new money being spent on Internet ads but are also taking share from the competition, GroupM said. 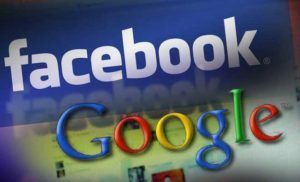 Google and Facebook will account for “186 percent of digital growth in 2017,” GroupM said. GroupM’s data omits China since media is heavily regulated there, though the U.S. behemoths are looking to break through China’s “Great Firewall”. GroupM said that, by medium in the U.S., TV will grow 3 percent to $81.9 billion in 2018; the Internet will grow 10 percent to $62.5 billion; print will shrink nearly 7 percent to $32.3 billion; radio will grow 3 percent to $7.9 billion; outdoor will grow 3 percent to $4.6 billion and cinema advertising will grow 2 percent to $40 million. In a separate study, Zenith Media noted that Internet advertising has overtaken television on a global basis, accounting for 37.3 percent compared with 34.3 percent. Zenith says that TV peaked in 2012, when it accounted for 39.3 percent of all advertising. Zenith also says that “the effectiveness of Internet advertising has now caught up with digital ad spend,” given its “brand experience” has hit 35 percent. Zenith’s study notes that the Internet’s share of advertising globally will reach 40 percent next year and 44 percent in 2020, when it hits $225 billion in ad spend.